Ding-Dong, the clock strikes midnight on the Vegas Golden Knights Cinderella Story. And what a story it was. From entering the season with little to no expectations, to crusading through the regular season and winning the division, to sweeping the LA Kings, to beating the San Jose Sharks, and the powerhouse Winnipeg Jets. The expansion Knights found themselves in the Stanley Cup Final. Unfortunately for Vegas and their rapidly growing fan base, that’s as far as they would go. The Washington Capitals beat the Knights in five games, ending off what was an absolutely amazing inaugural season. With the fan base tasting their first real defeat, the fans at T-Mobile Arena gave their new favourite hockey team one heck of a sendoff. June 2016: Vegas awarded an NHL expansion franchise, weeks after the opening of T-Mobile Arena. June 2017: Vegas selects players in the NHL expansion draft at T-Mobile Arena. 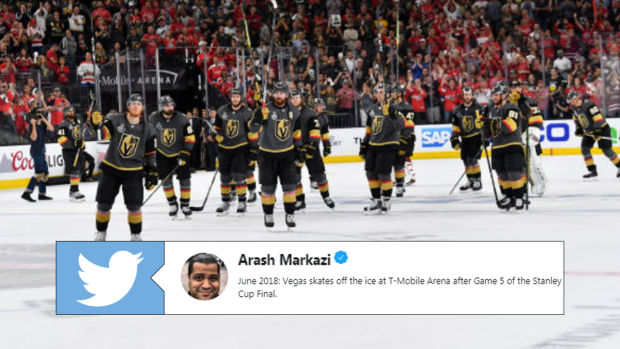 June 2018: Vegas skates off the ice at T-Mobile Arena after Game 5 of the Stanley Cup Final. Vegas does it big, and they didn’t disappoint with that sendoff. The raucous crowd is one of the loudest you’ll find directly after being eliminated. The love in Vegas is real.